You can still support Hospice Huntsville by placing a bid on our fabulous silent auction! Hospice Huntsville is hosting our annual Purple Tea Party with all proceeds dedicated to the Hike for Hospice Huntsville our largest signature fundraiser event. 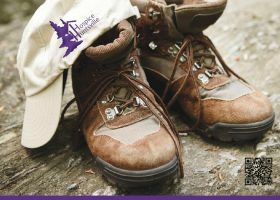 Hike for Hospice Huntsville is a time to celebrate and honour our loved ones in a special, meaningful way. All proceeds raised through the Purple Tea Party/Hike for Hospice Huntsville will remain in our community to ensure our community members will receive the end-of-life care they wish for and deserve. Hospice Huntsville would like to extend this invitation to you to become a contributor to our event. Purple Tea and Silent Auction: These fundraising activities will be held at the Huntsville Place Mall on Saturday, April 13, 2019. Come early to check out the auction items and purchase your tea ticket. a) The Silent Auction will be set up in the store across from Hallmark at the Mall.  Thursday, April 11, 2019 from 2:00 p.m. to 6:00 p.m.
 Friday, April 12, 2019 from 4:00 p.m. to 8:00 p.m.
b) The Purple Tea will be held in the Bears Den Restaurant (new location) in the Huntsville Place Mall on Saturday April 13, 2019. • Purple Tea Time: 1:00pm to 2:00 p.m. Delicious treats will be served with your tea. Would you like to support the Purple Tea Party fundraiser? Volunteers make our fundraising activities run smoothly so our events are fun and enjoyable for all participants. If you are interested in becoming a volunteer for the Purple Tea Party please contact 705-789-6878 ext. 236 or email hospiceH@vianet.ca. Hike for Hospice Purple Tea and Silent Auction: The Purple Tea and Silent Auction kicks off our annual Hike for Hospice Huntsville Fundraiser. 247 Items for you to place your bid! We at Hospice Huntsville realize that our local businesses support many community endeavors. provide end- of-life and palliative care to our friends, families and neighbours. Our Community will be that much richer for bringing together such wonderful people working for the common good.